Carillon at Cambridge Lakes in Pingree Grove, Illinois is Cambridge Homes' latest active adult community in the Northwest Chicago suburbs. Cambridge Lakes is a beautiful master-planned community comprised of nearly 3,000 homes, of which an estimated 1,297 will be devoted to the 55+ Carillon enclave. Carillon in Pingree Grove is a gated neighborhood complete with a large amenity center and ranch-style attached townhomes and single-family homes. The quiet town of Pingree Grove, near the intersections of Route 47 and Route 72, has transformed in recent years with the development of the Cambridge Lakes community. In 2007 Cambridge Lakes received the award for the best overall suburban community in the greater Chicago area by the National Association of Home Builders. The Carillon active adult phase of Cambridge Lakes began in 2007 and construction continues today. Carillon Cambridge Lakes recently unveiled a brand new state-of-the-art clubhouse. This magnificent facility boasts an exciting lineup of great amenities such as a fitness center, aerobics studio, indoor pool and spa and outdoor pool. 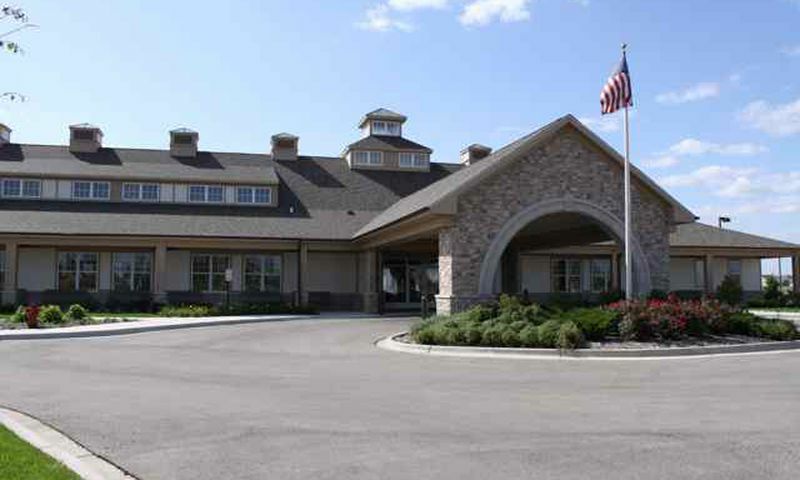 The clubhouse serves as the social hub for all community social and club activities at Carillon in Pingree Grove, IL. There is a large ballroom that hosts community gatherings as well as dinners and parties. There are several hobby and craft rooms plus a billiards room, computer lab and library.Outside in Carillon Cambridge Lakes are tennis courts, bocce ball courts and walking and biking trails. A 3-hole golf course provides the perfect place to practice your short game. Carillon at Cambridge Lakes offers a wide variety of housing styles that are very reasonably priced. Buyers can select from single-family homes, duplexes and attached single-level townhomes arranged in quads. The Resort Series single-family homes in Carillon Cambridge Lakes include ten floor plans that range from 1,475 to 2,322 square feet. These luxuriously appointed homes include two or three bedrooms, two or two and a half baths, two-car garages (with optional three-car garages) and optional basements. For homebuyers on a more modest budget the Composer Series duplexes include four floor plans that range from 1,401 to 1,716 square feet. These single-level units include two bedrooms, two baths and a two-car garage. A den is included on the two largest plans, which is ideal for an office or relaxing TV room. The Bayside Series townhomes in Carillon Cambridge Lakes offer the ultimate choice for inexpensive, maintenance-free living. These quad style, single-level townhomes are offered in four floor plans from 1,107 to 1,332 square feet. All units include two bedrooms, one or two baths and two-car garages. Homeowners in the Composer Series duplexes and Bayside Series townhomes enjoy a complete maintenance-free lifestyle with the association managing all lawn care, snow removal, landscaping and exterior maintenance of the homes. Carillon at Cambridge Lakes is located half a mile east of Route 47 on Route 72 in Pingree Grove, Illinois. It is one section of the larger neighborhood named Cambridge Lakes. The community is located two miles south of the Northwest Tollway and only 45 miles from downtown Chicago. Carillon at Cambridge Lakes is ideally situated in a quiet setting, but very accessible to places like the northwest suburbs, Woodfield Mall in Schaumburg and O'Hare Airport. In addition, Route 47 is emerging as one of the main thoroughfares in the northwest suburbs, making Carillon an ideal location for shopping, restaurants and everyday conveniences. Just north of I-90 on Route 47, residents have access to a Jewel-Osco, the Huntley Outlet Mall, Wal-Mart, Home Depot and more. The Randall Road corridor is six miles to the east where residents have access to a myriad of shopping and dining opportunities. With so much to do both near and far, it's easy to see why Carillon at Cambridge Lakes is a wonderful 55+ community in Illinois. Clubhouse - 18,000 Sq. Ft. There are plenty of activities available in Carillon at Cambridge Lakes. Here is a sample of some of the clubs, activities and classes offered here. The Bayside Series townhomes are the most affordable option in Carillon at Cambridge Lakes. These single-level townhomes are built in quad configurations with each unit occupying a corner of the building. All homes include at least one bedroom plus a den or two bedrooms. All Bayside series townhomes are built on a slab and there are no basement options. Exterior building maintenance, lawn care, snow removal and landscaping is maintained by the association. The Composer Series duplex homes are available in four floor plans. Each building contains two units attached side-by-side. All homes are built on a slab and there are no basement options. Each model includes a covered front porch and optional sunroom. These ranch homes are ideal for buyers who want adequate space while still enjoying the maintenance-free aspect of an attached home. Exterior building maintenance, lawn care, snow removal and landscaping is provided by the association. The Resort Series single-family homes are offered in ten floor plans. These thoughtful designs offer open layouts that include spacious family rooms, expansive kitchens, dining rooms and living rooms. All homes are single-level except for the Sun Valley model. Additional options such as sun rooms, extended family rooms, three-car garages and basements provide for even more space. The association maintains all lawncare, snow removal and landscaping but homeowners are responsible for maintaining the exterior of their homes. The Freedom Series single-family homes are offered in six floor plans. These thoughtful designs offer open layouts that include spacious family rooms, expansive kitchens, dining rooms and living rooms. The association maintains all lawncare, snow removal and landscaping but homeowners are responsible for maintaining the exterior of their homes. A little over a year ago I moved into the home that I just had built by D.R. Horton. The home was built in a community for senior citizens and Horton completely took advantage of us. I had constant problems with them during the build. I have now lived in the house for more than a year. I had dozens of warranty complaints during the first year and for the most part they just swept the dirt under the rug. I am totally unsatisfied with the HORTON experience! What should have been the happiest time of my life turned into a nightmare that got worse every month!! I have been cheated out of many tens of thousands of dollars. Prior to the build I asked for a change order to remove the closets in the 3rd bedroom in order to properly fit my office furniture and expected a meeting with the engineer. Instead I was emailed that the closets would be removed. This was again confirmed at the pre-construction meeting with Jeff, the engineer. At the pre-drywall meeting with Jeff I pointed out that the closets were still there and there was a water meter in one of them. I complained and said no water meter was shown in the drawing and the model had it on the outside. I was then told that the water meter would be removed. This would them allow the closet to be removed. As it turned out all they removed were the doors, light, hangers and shelves from one of the closets. The empty closets and the water meter were still there. I lost $3500 worth of materials and labor that I paid for and still was unable to use my office furniture as I still had the closets, and my house now loses $5,000 in value as it only has 2 bedrooms. I then asked them to restore my closet to its proper functionality, i.e., install the doors, light, hangers and shelves? They refused. I then asked to get a credit for the $3500 worth of materials and labor that I was not getting. They again refused. This is the most poorly and cheaply built house I have ever seen. The cement slab is cracked all over. There is not a good 2x4 in the entire frame. Nothing in the entire house is square. All doors are poorly hung, none of the doors are true due to and uneven frame. There have been numerous adjustments to no avail. At times the front door cannot be locked. When a shower door is closed you can feel it thru the whole house. When the wind blows hard the whole house shakes. There is excessive drywall putty and paint bubbles in numerous places. I had to have all of the cable connecters has to be replaced. The locks are particularly inferior, one had to be replaced, one had to be fixed and others will have to be replaced!! We were locked out of our bedroom for a day and I we live in constant fear of being locked out of all rooms or the house! The floor tiles are unevenly spaced and are not level, we constantly stub our toes on them. There are a few unpainted areas. In several places there are gouges in the drywall. The plumbing that drains the toilet bowls and the sinks in the bathrooms must have a kink in the line causing them to plug up frequently with NORMAL use. The wall in the living room is extremely crooked. Poor workmanship under the kitchen island. The molding by the door trim going into the MBR does not go down to the floor. There is damage on some of the cabinets. The garage is out of square up to 4.5 inches, there is damage to the concrete and wall on the back right side and cracks in the concrete on the left, primer dripped on the cement all around. The walls of the garage have putty all over and are uneven. The frame in the front of the garage door is out of square. In the MBATH the walls are not square and the baseboard is uneven. The linen closet door well is out of square so bad that the door does not fit properly. The entrance door well is badly damaged and distorted by the workers that tried to repair it. There are dents in the drywall. There is a gouge on the floor of the shower stall. Noise in the fan shutters and the fan cover in the ceiling is hanging out. On cold days the furnace is not sufficient to heat the house and the furnace filter doesn't pick up dust. At the end of the warranty period I still have all of these problems and more that they would not fix. Two of the shrubs they planted have died. My tree in front is dying. The landscapers do a terrible job maintaining the area and the driveway re-coaters get tar all over the sidewalks and the grass. The house next door to me recently flooded. A cap on a plumbing fixture wasn't glued and it popped off. When they came home they had a foot or water in the house. The entire house had to be gutted up to 1 foot. It is now two weeks and the repairs are still going on. Two houses across the street has a similar situation. They were home at the time so the damage was limited to 1 room and the basement. We all now live in constant fear, waiting for our house to flood. Two of our shrubs died and another scrub and our tree are dying. The soil is so full of clay it is hard to grow anything. The Radon level is the highest in Illinois and they went to great lengths to hide this fact. The lots have such a steep grade it is extremely hard for a senior to walk in their yard. Everyone, all seniors, in the community feel the same way. This is a young neighborhood. The people are young and young at heart. The activities are great and while the community is still growing, they will improve and grow along with progress. This is a wonderful area to live in with large open areas and peaceful living. The homes are still being built, but are being sold very quickly. We're very happy that we made the choice to live here. Very nice active adult community with newer homes. So many activities at the clubhouse for residents. Highly recommend! We moved to Carillon in September 2012. Although we had lived in Wood Dale for 34 years we never really felt connected to the community. Since moving to Carillon we have made many friends and our calendar is full of fun activities. We both agree that moving here was the best thing we could have ever done and just can't imagine living anywhere else! We moved into Carillon in November of 2008 from Tinley Park. We chose this community to be close to our grandchildren in Elgin. Prior to selecting Carillon we visited a number of other similar subdivisions and found that the homes were by far the best relative to cost and layout. The clubhouse offers opportunities for residents to participate in clubs, fitness(swimming and wellness center), and relaxation. A golf course was constructed in the fall and will be ready for play in the spring(2013). There is a property manager and lifestyle director on site. We love being part of this community and enjoy our friendly neighbors. We recently moved to Carillon at Cambridge Lakes from Richmond about two months ago. Prior to selecting Carillon we did visit the surrounding 55 communities in the area and chose this one because of size of the community and the amenities. The community itself is the perfect size for us - not overwhelming. The location is ideal for our needs and we feel as if we are still in the country especially backing up to the lake. An added benefit is that we are now living closer to our grandchildren. The clubhouse with the pool and fitness center is great, the walking paths and golf course grounds are just beautiful. There is an abundance of great shopping and restaurants nearby. The common areas are beautiful and well-maintained and we like the fact that this is a gated community. We are quite pleased with our choice! We moved from Hoffman Estates and have lived in Carillon at Cambridge Lakes for about 3 months. We selected Carillon because we liked the amenities and size of the community - big enough but still small enough to have that friendly feel. Our neighbors are very friendly and made us feel welcome. We use the clubhouse (work out area) every week and just attended our first holiday party. We can't say enough about the community. My husband and I have lived in Carillon at Cambridge Lakes since the summer of 2010. I can truly say that moving here has changed our lives and our marriage--in a really good way. We get to spend more time with each other because we don't have to worry about mowing grass, shoveling snow, or even pulling weeds. We have more friends than we've ever had, and there is always something interesting to do here. The community is very inclusive, we love our home...we even started a band that we're both part of. Who would think at our age that we'd be singing rock music and playing gigs. Our lifestyle director and club manager are both very tuned into the needs and requests of the residents. If there is some activity or class that you want and it's not already here, they help you get it going. We LOVE living here. We really do! We have lived in Carillon at Cambridge Lakes for almost four years, and we love it. We believe the models are nicer than at Del Webb. We love the community, our neighbors, and are actively involved in many activities and programs. Really nice clubhouse with indoor and outdoor pool. And, we are getting our 3-hole golf course in 2013. Nowhere near the amount of rules that Del Webb has, only the necessary ones. We moved to Carillon in Pingree Grove in December 2009 after living in Hoffman Estates for 25 years. Shortly afterwards we attended our first party at the Clubhouse and we met many home owners. They were very friendly and invited us over to there houses and made us feel very welcome. Ever since then we feel part of a big family. We have a great community. The Lifestyle is very relaxing with plenty of activities. One of the many benefits in living at the Carillon is that they take care of mowing the grass, trimming the shrubs and snow removal. It's sometimes difficult to leave when you have lived in your home for 25 years but we have a new home and more friends than ever. It was the right decision. We love it here. 55places.com is not affiliated with the developer(s) or homeowners association of Carillon at Cambridge Lakes. The information you submit is distributed to a 55places.com Partner Agent, who is a licensed real estate agent. The information regarding Carillon at Cambridge Lakes has not been verified or approved by the developer or homeowners association. Please verify all information prior to purchasing. 55places.com is not responsible for any errors regarding the information displayed on this website.